In the northwestern corner of Washington State lies the breathtaking Olympic Mountain range. 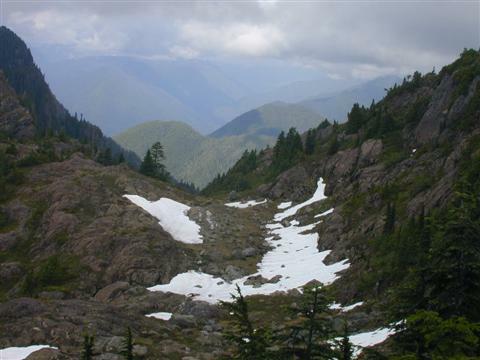 Relatively close to the ocean, these tall mountains force the clouds to drop much of their moisture, about 120 inches (305 cm) per year, in the Olympic rainforest area. Lake Quinault and Colonel Bob Mountain are in this high rainfall area. This year we decided to take our family vacation at Falls Creek campground on Lake Quinault.. We stopped by the ranger station near Lake Quinault to see what trails were near by. The Colonel Bob trailhead was about 3 miles (4.8 km) from the campground. It sounded like a good day hike. 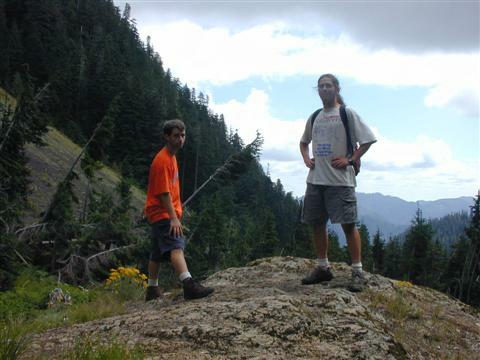 The trail is 7.2 miles (11.6 km) long with a 4200 feet (1280 m) gain to the summit of Colonel Bob. The view from the top promised to be spectacular with panoramic views of Lake Quinault and the Olympic Mountains. Chris and Nick (my sons) and I started out in the early morning. We packed lunch, water, binoculars, camera and a wildflower book into our day pack. It was a nice cool day for the 3 mile (4.8 km) bike ride to the trailhead. We locked the bikes and started out. I let Nick and Chris lead most of the way. With them setting the pace, we would make good time. For the first 3 or 4 miles (4.8-6.4 km) the trail wound upward through lush rainforest vegetation beneath towering old growth conifers. After traveling about 3.5 miles (5.6 km), we came to a dry seasonal stream bed at approximately 2000 feet (610 m) elevation. It looked like a good place to stop for lunch. There was very little vegetation in the streambed; a few little annual weeds and a very healthy specimen of Sedum oreganum in full bloom. While I was taking pictures of the Sedum, a bumblebee alighted in a blossom and began its busy work. Overhead, there was a little break in the trees allowing the sun to shine for a short time each day. 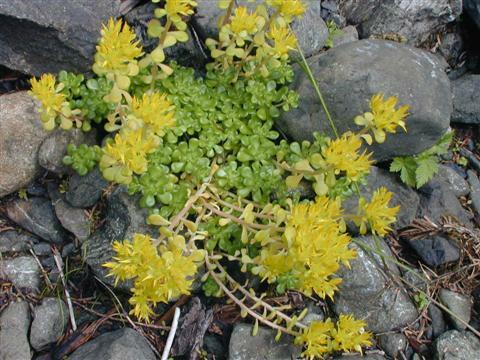 Since the river bed is full of water during the winter months, I assume that the Sedum grew from seed to its current size in one growing season. Maybe this winter it will get washed down stream and end up growing on a bank down the way. We continued on, feeling invigorated from our lunch break. The scenery kept getting better as we went on. At about 3000 feet (914 m) elevation the terrain became very rocky and steep. Avalanches and rock slides had taken out most of the trees. The view opened up nicely. Small flowered tiger lilies rose out of the grassy hillside above us. 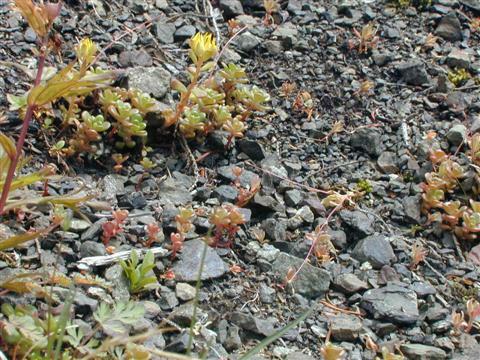 Nearing 3500 feet (1067 m) was a scree dotted with small Sedum oreganum, some of which were just starting to flower. Since they were fully exposed to the sun, some of the Sedums were taking on a nice red hue. The few trees at this point were smaller and windswept. Below us were patches of snow that must have been what was left from winter and spring avalanches. 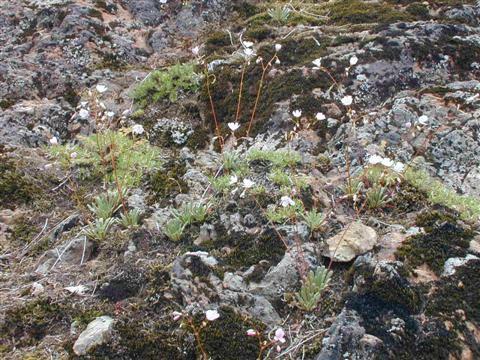 A little further up the trail, seemingly growing out of cracks in otherwise solid rock were numerous Lewisia columbiana rosettes in full bloom. Heading down the path towards us were 3 veteran hikers. One of them was wearing leg weights. I was considering turning back due to leg cramps, but the hikers said there was only another 15-20 minutes left to reach the top of Colonel Bob. So we continued on. At 4000 feet (1220 m) the trail leveled off and the ground became quite moist. 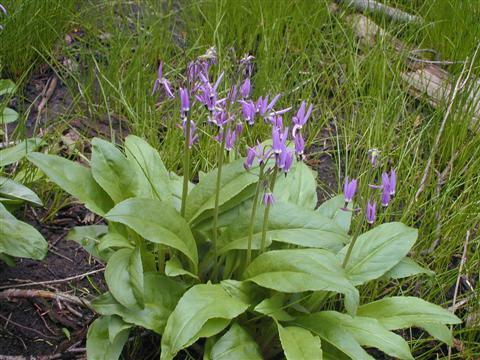 Large clumps of Dodecatheon (Shooting Star) were in full gorgeous bloom. The last part of the hike was very rocky and steep. The top of Colonel Bob Mountain looked devoid of plant life from down the trail, as if Bob were bald. But when we arrived, we could see that there was a variety of plant life tucked into the nooks and crannies. Penstemon, Phlox and Lewisia made up Bob's toupee. We stood at the top of the mountain and looked around. Unfortunately, the view that we came to see was obscured by a low cloud. After a snack and a drink of water we said good bye to Bob and began the long trip back to camp.